It’s that time for New Year’s resolutions again, and for many of us, the first thing we’ll address is how to improve our finances in the coming year. Maybe this new year brings something specific you’ll need to save money for, or maybe you’re just resolving to be more financially disciplined. But no matter what you’re saving for or why you’re doing it, a budget will undoubtedly be the best place you can start. In this guide, we’ll provide tips, steps and tools you can use for a more financially secure new year. 1. Understand why you’re budgeting and what it will do for you. 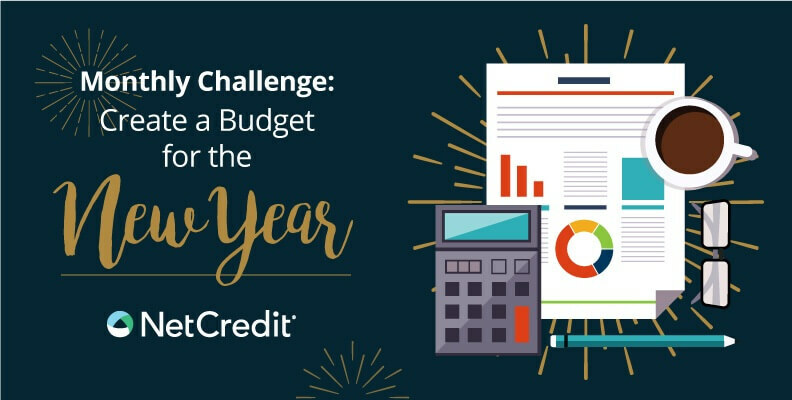 If you’re starting a budget just because it seems like a good New Year’s resolution, it probably won’t last very long. Understand that the main objective of budgeting is to help you spend less than you earn — so that you can have more money to save. Budgeting will show you the areas of your life that are weaknesses for your spending habits, and it will provide structure for you to improve in those areas. 2. Establish a specific long-term goal. For many people, saving for a house or retirement is their long-term budgeting goal. For others, it might just be freedom from debt. Whatever your long-term goal is, having one in mind can be very useful when creating a budget. Knowing that the sacrifices you make in your life now will allow you to achieve something you really want will make budgeting much easier. 3. Reward yourself for accomplishing short-term goals. While long-term goals are entirely necessary, they don’t always help you make the day-to-day choices. So create some short-term goals. For example, you could set a monthly dining budget and go out guilt-free if you’re under budget at the end of the month. These simple motivators should help to keep you on track for your bigger goals. Budgeting works best when you are as accurate as possible with the information you use. This means pulling out your bills and saving all of your receipts for a couple of months and figuring out exactly how much you’re spending and what you’re spending it on. Your first “budget” shouldn’t actually be a budget at all — it should just reflect your spending in an average month. 5. Use a budgeting tool that works well for you. If you start off overwhelmed by the number of apps or the complexity of the software, it’s going to be difficult for you to maintain your budget. Your first budget should be incredibly easy to use and manage. For many people, getting started with pencil and paper is the best way to go. Once you’ve gotten a handle on the process, try some of the tools and resources we’ve included near the bottom of this post. 6. Have bank accounts that have budgeting tools incorporated by default. Does your bank offer automatic transfers from your checking account to your savings account? Does your bank offer online bill pay? Ideally, the answer to both of these is yes. Now, does your bank charge you maintenance fees on your account? Do you have to pay a lot in ATM fees? Hopefully the answer is no. If yes, reach out to your bank to see if there are other types of accounts without fees or anything that would qualify you to avoid them. 7. Use the support of friends and family. Whenever you’re attempting to make a significant change or create better habits, it’s much easier to do so with a little support. Look to your spouse, parents or closest friends for help. If you regularly surround yourself with people that will encourage poor spending habits, your budget probably won’t last long. Small steps work; trying to make a massive step often results in failure. Don’t pledge to reduce your dining and entertainment spending by 80% right away. It won’t work over the long haul. Instead, average out what you’ve spent on dining and entertainment for the last few months and pledge to cap that area at 5 – 10% below that average. Then, after some time and some success, cap it a bit more. Figure out your monthly take-home income. This amount is the total amount you receive each month from your paychecks. It doesn’t factor in your income before taxes (and any other subtracted amount for insurance). Choose a budgeting plan. A budget should cover all of your needs and some of your wants, plus savings for emergencies and the future. Keep track of your spending. Record your spending in a journal or use one of the online budgeting tools listed below. Set yourself up for success. Automate as much as possible to make allocating money to specific purposes/payments as easy as possible. Revisit your budget and tweak it as needed. Your income, expenses and priorities will continually change. Adjust your budget accordingly each month!